From Dana Lyons: While large-cap tech stocks continue to reach new highs, small-caps have struggled to keep up. For much of the post-February rally, we have seen small-cap stocks leading the way. That dynamic has kept much of the possible consternation over “bad breadth” at bay, thus far. In recent days, however, a few developments have cropped up that have some market participants beginning to worry about the level of participation in the rally. We observed one such development when looking at yesterday’s market action. While the Nasdaq rose solidly to new all-time highs on the backs of some large-cap tech stocks, small-cap stocks struggled mightily. This divergence resulted in one of the more lopsided new highs we’ve ever seen in the Nasdaq 100 (NDX). 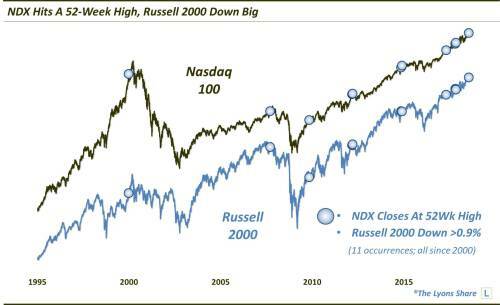 Specifically, while the NDX closed at a new high, the Russell 2000 (RUT) small-cap index actually fell more than 1% on the day. That is only the 7th time we’ve ever witnessed such circumstances. As the chart indicates, it’s also just the 11th time we’ve seen the RUT drop as much as 0.9% when the NDX hit a 52-week high. 4 of the occurrences now have taken place in just the past 15 months. And, while prior occurrences were not always a harbinger of trouble in the market, we did see similar days in the vicinity of significant tops in 2000, 2007 and 2014-2015. So, should we be concerned about a newfound lack of participation in the rally? Making that determination probable requires a deeper examination of our current situation as well as the circumstances surrounding prior events. In a Premium Post at The Lyons Share, we take a deeper look at the data, present and past, to determine how concerned we should be about this small-cap “divergence”. The iShares Russell 2000 Index ETF (IWM) rose $0.14 (+0.08%) in premarket trading Thursday. Year-to-date, IWM has gained 10.12%, versus a 6.85% rise in the benchmark S&P 500 index during the same period. IWM currently has an ETF Daily News SMART Grade of A (Strong Buy), and is ranked #1 of 41 ETFs in the Small Cap Blend ETFs category. This article is brought to you courtesy of Dana Lyons, JLFMI and My401kPro.